Let’s face it- the work week can get BORING. I’ve found that during the school year I need to get out of the house at least once a week when I get home, and now that I’m off for the summer and home all day, I want to go out at night during the week because I’ve been cooped up doing my DIY projects all day. I’m just one of those people that just loves spending time with my husband, and I want to break the monotony of the work week and get out. I blame my parents- they LOVE going out during the week, and I’m pretty sure it’s rubbed off on me! I started thinking about the fun things that Mathew and I have done during the week, and thought you all would enjoy this list of 5 cheap weeknight date ideas. 1. Guy’s Grocery Games Date Night- Mathew and I were watching Guy’s Grocery Games on Food Network a couple weeks ago and saw a challenge where the competitors had to go to 9 different aisles and get 1 item per aisle. I mentioned how that would be SO much fun, and Mathew suggested we do it! With 1 protein, 1 vegetable, and 5 aisles, we modified Guy’s Grocery Games into an absolute BLAST of a date night. We ended up cooking together because we’re not competing like in a show, but you could always do this with someone creating a main course, and the other person creating a dessert. You’d be surprised how creative you can be and how fun this can get! 2. 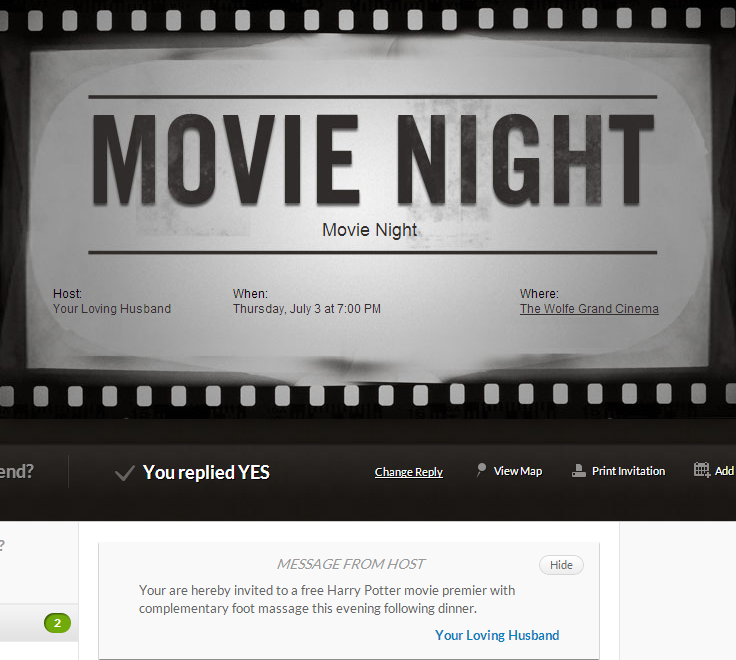 Evite Movie Date Night- Mathew is incredibly creative when it comes to weeknight date ideas. Earlier last week I told him that I was bored at the house because he’d taken my car to work (his car has no a/c right now) and I needed to do something fun when he got home. A few hours later I got a text to “check my email” and I’d gotten an Evite invitation for a movie date night! Of course, he barely knows how to use Evite and put the wrong day for the date, but it’s the thought that counts! When he got home I had dinner ready and we watched Harry Potter for the night. Sure, we fell asleep 3/4 of the way through, but hey- it was still good because we snuggled on the couch instead of one person being on the computer and one person watching tv. 3. 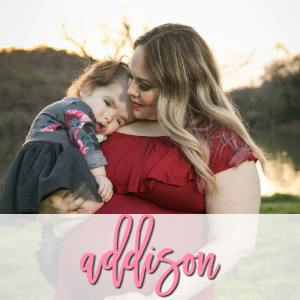 BJ’s Restaurants Dine In Order Ahead and Mobile Pay- Our soon-to-be daughter, Addison has some complications (see posts 1 & 2) which causes Mathew and I to have to travel to a town 30 minutes away every other Tuesday for our doctor appointments. Usually our appointments start at 2, but lately they’ve been anywhere from 1 pm to 6 pm. Once, we even had to stay til almost 9 pm for blood tests! After traveling, being poked and prodded, and dealing with terrible traffic from construction, the LAST thing we want to do is go home and cook. BJ’s Restaurants has their BJ’s Mobile App (available for iPhone and Android) and it just came out, so the other week Mathew and I downloaded the app to our phones and decided that we were going out to dinner after our long day. 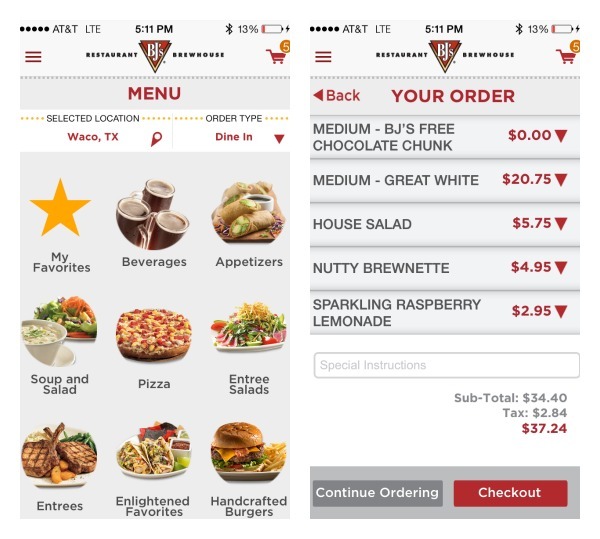 The BJ’s Mobile App has a feature called Dine In Order Ahead, where you can look at the menu, choose what you want for dinner (even your drinks!) and order ahead. I ordered our meal in the car on our way from the doctor’s office to the restaurant! We ordered a pizza, salad, pizookie, and our drinks and checked out the rest of the app. As I looked through the app, I realized they also had a Preferred Waitlist feature, where you can let the restaurant know you’re coming and they’ll put you on their wait list early. Of course, I put our names down, and we headed to BJ’s Restaurants. Once we got to BJ’s Restaurants, we didn’t have to wait at all! We got seated, let our waitress know that we had our meal already chosen with the BJ’s Mobile App, and within 5 minutes we had our drinks and salads on our table. The great thing about this app, is that although you make your meal selection with the app, they don’t start cooking your food until you’re seated so your salad isn’t soggy and your entree is nice and hot. 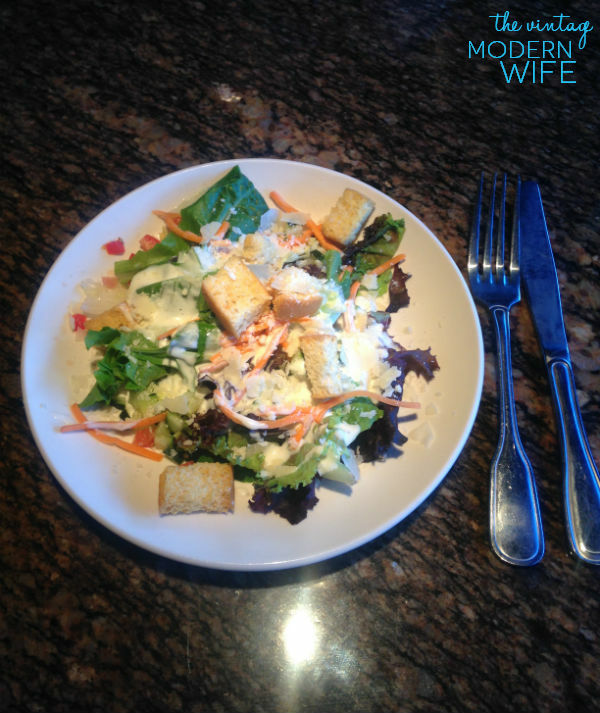 Mathew and I were seriously impressed at how fast our drinks and salad came though. I barely finished my salad when our pizza came out. Doesn’t this look amazing?! I showed y’all a little sneak peek of it on Instagram, but I think this picture does it WAY more justice. I usually get pepperoni pizza when I go to BJ’s restaurants, but this Great White was AMAZING. We also got an original pizookie, a perk because we just HAPPENED to go in on the day that they were offering a free pizookie if you used the BJ’s Mobile app! If you’ve never had a pizookie, you haven’t lived. Our pizookie was piping hot from the oven, and had a freezing cold scoop of ice cream on top. TO DIE FOR. You want to know the crazy thing?! Mathew and I were in and out of BJ’s Restaurants in about 30 minutes on our weeknight date! Tell me that isn’t awesome. I plan to use this app ALL the time, especially on nights when I know they are going to be really busy. We were so thankful for a quick and painless dinner, and happy to be home at a decent time so we could just rest from our busy day full of appointments. 4. At Home Spa Date Night- Another one of our weeknight date ideas that Mathew and I always enjoy is an at home spa date. I buy bubble bath, fresh new loofahs, lotion, and grab our portable DVD player. With my back hurting from this pregnancy belly, bubble baths are my absolute favorite. Mathew gives me time to just chill in the bath with my favorite movie, You’ve Got Mail, playing on the portable DVD player. It’s great just to have ME time, ya know? The best part about this date, is that once I’m in pjs, I can usually convince him to give me a leg and foot massage with my favorite lotion. Getting pampered is one of my favorite weeknight date ideas. 5. 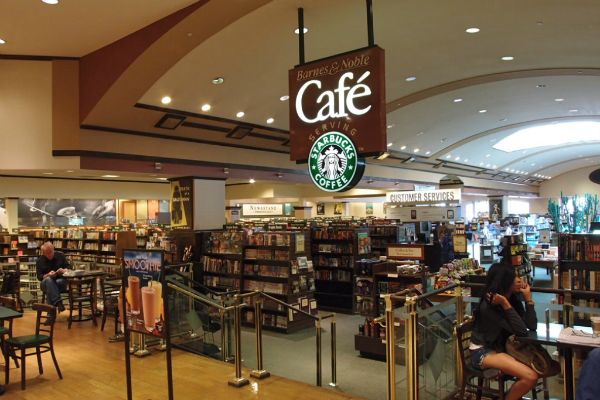 Coffee and a Magazine Date Night- For as long as I can remember, Mathew and I have been going to Barnes and Noble to have coffee and a magazine date night. We grab our favorite coffees, and then load up on our favorite magazines. Usually he gets 1 and I grab 4 or 5 gossip magazines. It’s fun to sit there with him and laugh over silly celebrity pictures, or have him show me things that he claims I HAVE to buy him. It also just gets our minds off things and we can enjoy a fast weeknight date night from 15 minutes to 2 hours, depending on how much free time we have. Over the years, this has probably been one of our #1 weeknight date ideas because it’s easy, cheap, relaxing, and fun. 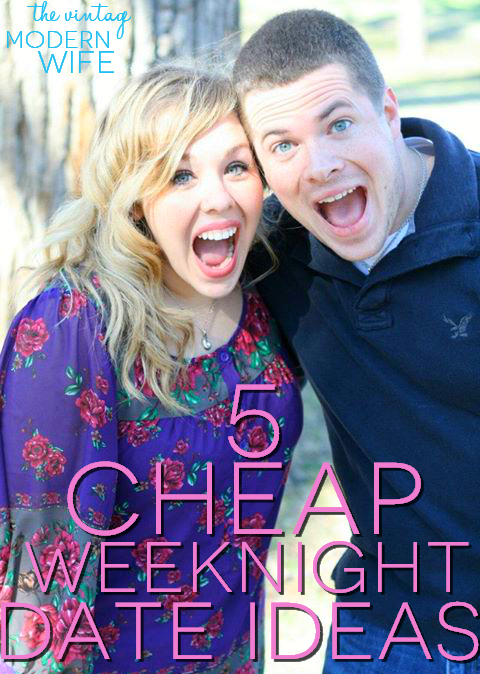 I hope these 5 cheap weeknight date ideas have given you some new ideas on what to do during the week! They really all are so much fun, and perfect for a weeknight. 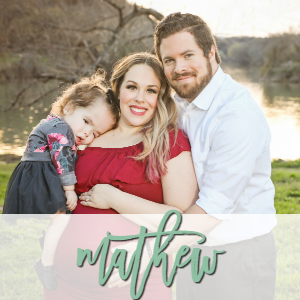 Mathew and I hope that you enjoy them as much as we always do. Which date looks like it’ll be your favorite? Sound off in the comments! OH MY GOSH! That is the best app EVER! So time saving! I wish we had one of those BJs around us. That looks awesome and order ahead?? Yes, please! We don’t have a BJs here, but loved the one in Florida! Great food quality and super friendly staff. These are great ideas for weeknight date nights – with a kiddo our weeknights are often busy, but I think I could incorporate a few of these into the week! 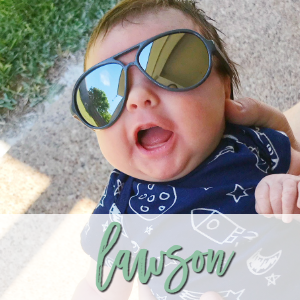 Emily recently posted…My Summer Fun To Go Bag Essentials: 5-hour ENERGYÂ® and more! Seriously great ideas!!! And the BJ’s Mobile App?? Brilliant!! Great ideas. Pinning to my date night board and you guys are too cute! Omg I LOVE Guy’s Grocery Games, and I never thought to turn it into a date night game, how fun! I also love BJs, so yummy! 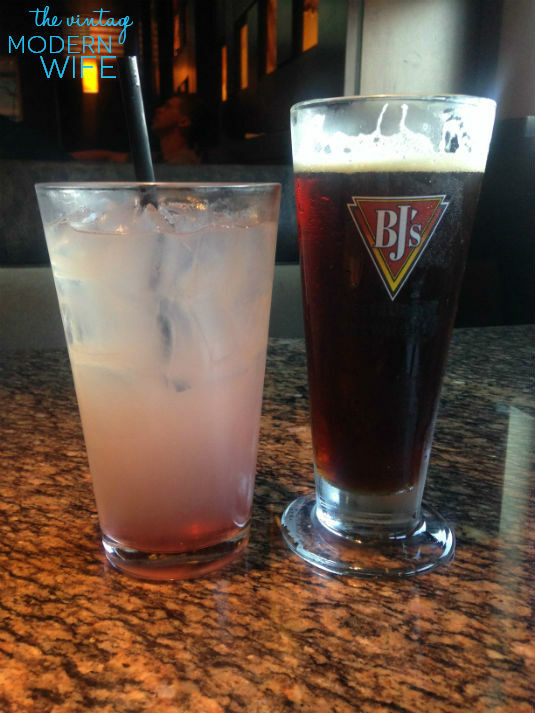 Date night + BJ’s Restaurant + that awesome Mobile App = awesomeness! How much do I love BJ’s pizza and Oreo Pizzookie! Yum! Oh my goodness! What a cool app! I wish I had a BJ’s near me!! 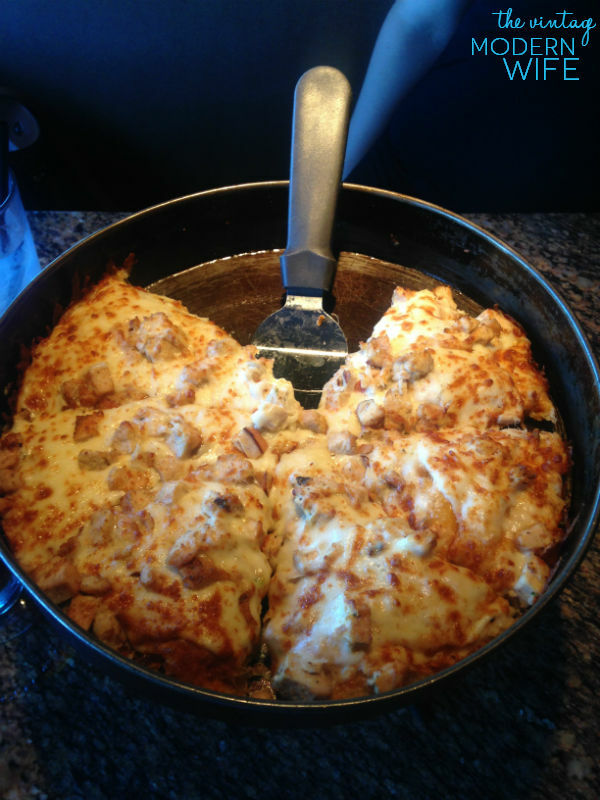 I SO need some pizza, so wish we had a BJ’s! the pizookies from BJ’s are so good! 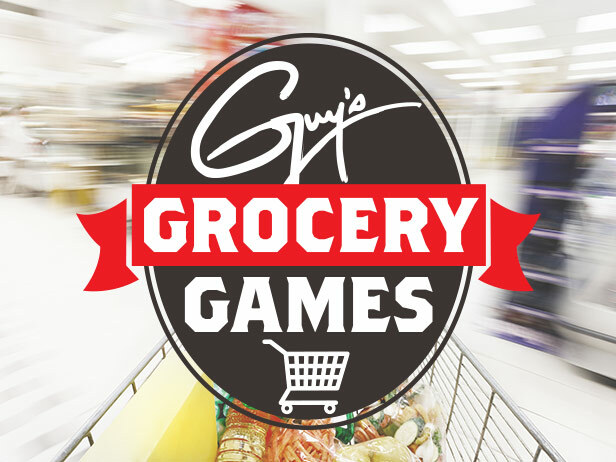 love the idea of doing guy’s grocery games as a date night! so creative. 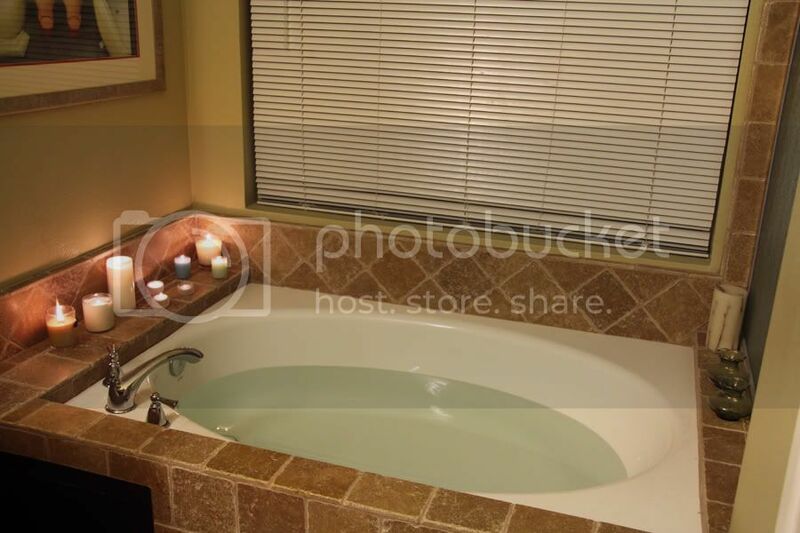 That bathtub looks heavenly! We are movie date night people ourselves, typically we just rent one to watch at home but it’s great when we are able to make it out to the theatre to see one! Love these ideas and OH MY GOODNESS you have the best bathtub ever! I love date nights. Great ideas! AH! I havent seen your blog in forever. So glad I found you again. Great date ideas!! I love Guys Grocery Games. J and I cook once a week at his house and its seriously our favorite thing to do together! That’s so creative! 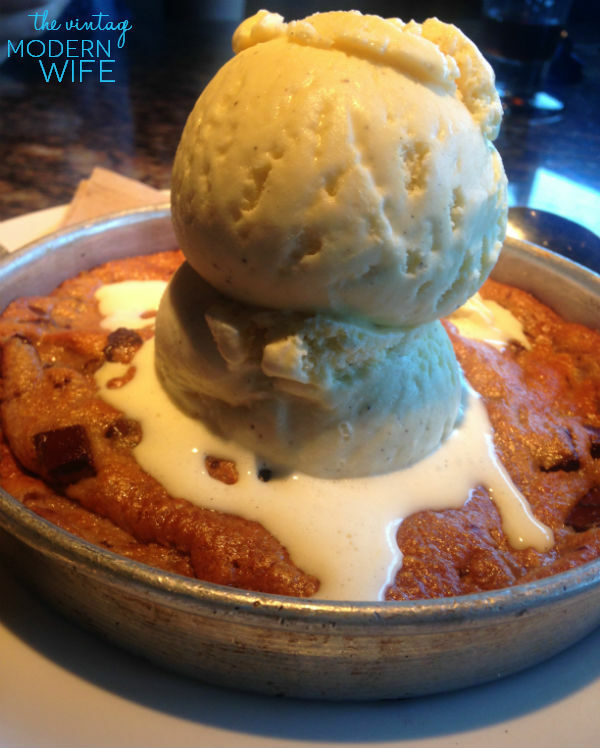 And that pizookie looks incredible!! What great ideas!!!! I love this!!!! !